UV-C is getting more and more attention while there is a growing awareness of the negative effects caused by chlorine and its by-products. That’s why manufacturers and installers of swimming pool filter systems are recognizing and accepting UV-C purifiers more and more as a standard. NEW: The Blue Lagoon Buster UV-C has up to 35% more UV-C yield as a result of reflection by the Stainless Steel reactor. NEW: The Blue Lagoon Signal UV-C is equipped with an integrated LED-timer which accurately monitors and visualizes the number of remaining operating hours by changing colour. The AOP Compact Ozone & UV-C combines the benefits of ozone and UV-C in one smart designed oxidation and disinfection system. Also available for saltwater pools. With the Blue Lagoon Xpose UV-C a new high quality UV-C TL unit in 30 and 55 watt is introduced. With a large reactor diameter and a special water guidance inside the house for an optimal exposure. The Blue Lagoon UV-C Copper Ionizer is a revolutionary purifier that combines UV-C and copper electrolysis. The Blue Lagoon Timer is equipped with an integrated timer which accurately monitors the number of operating hours. You can therefore see exactly when the lamp must be replaced. Because of its compact size, the Blue Lagoon UV-C Tech is ideal for all filter installations where space is limited but a high disinfection efficiency is needed. 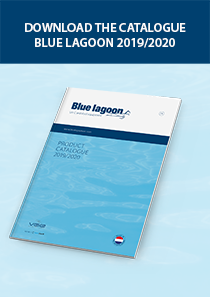 The housing of the Blue Lagoon UV-C Inox is completely made of 316L stainless steel and is the driving disinfection force for (high-end) swimming pools. The Blue Lagoon Saltwater is especially developed for disinfection of saltwater. Therefore, the purifier is besides chlorinated water also very suitable for salt- and seawater pools. 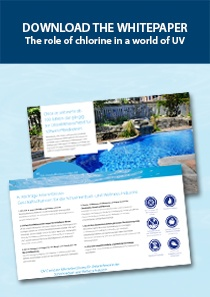 The water in domestic swimming pools often stays in the pool for long periods of time. Pool water can get infected with harmful micro-organisms as bacteria, viruses and algae by everything that enters the water. Heating up the water accelerates this process even more. People, animals and debris from around the pool make it crucial to have a good disinfectant. Most domestic pools use chemical disinfectants like chlorine to kill the micro-organisms that are a risk for the health of the swimmer. The use of these chemicals make sure that most micro-organisms are killed. Unfortunately, they are also the cause of the most issues for bathers (eye-, skin irritation, breathing difficulties) and have a big negative effect on the materials the pool is build with.